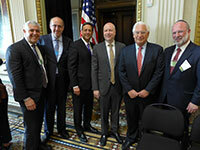 Washington, D.C. – A delegation of 100 Orthodox rabbis and communal leaders from across the country – from California and Kentucky to New York, Pennsylvania and Florida – converged on the nation’s capital Wednesday for the Orthodox Union Advocacy Center’s 22nd annual Leadership Mission to Washington, D.C.
During the day-long event, the participants met with top administration officials at the White House, heard from several U.S. senators, met with U.S. representatives and their staff and attended an address by U.S. Attorney General Jeff Sessions, who announced the creation of the Justice Department’s “Place to Worship Initiative,” a religious liberty proposal focusing on protecting houses of worship and other religious institutions rights to “build, expand, buy, or rent facilities” under the provisions of the Religious Land Use and Institutionalized Persons Act. Throughout the day, the Mission delegates advocated for the Israel Anti-Boycott Act (H.R. 1697/S.720) and to increase funding for the federal Nonprofit Security Grant Program, which awards religious schools, synagogues and other houses of worship grants of up to $150,000 apiece to improve building security. 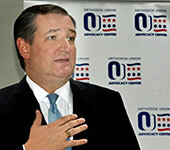 Senator Ted Cruz (R-Texas) addresses participants at a lunch during OU Advocacy Center’s Annual Leadership Mission to Washington, D.C. 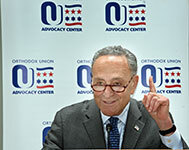 Senator Charles Schumer (D-N.Y.) addresses participants at a lunch during OU Advocacy Center’s Annual Leadership Mission to Washington, D.C. 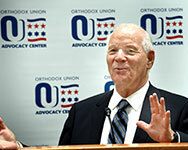 Senator Ben Cardin (D-Md.) addresses participants at a lunch during OU Advocacy Center’s Annual Leadership Mission to Washington, D.C.